Disclosure: This is part of a sponsored campaign. All opinions are my own. I love avocados and use them often in my cooking. They just add so much to a recipe and I think that they can be versatile. I love putting them on sandwiches, in soups and of course guacamole is amazing. As a registered dietitian, I love the health benefits of avocados. They are a good source of fiber, potassium, vitamin E, folic acid and B-vitamins. When Adalyn is old enough to eat real food, I will give her avocado because I hear that babies love them and I like that they are so packed with nutrition. They are a good source of monounsaturated fats which can help to lower cholesterol when used in place of saturated fats. On a salad or something that needs a boost of beneficial fats, this is a great option. It is important to eat healthy fats. I try to get some in most meals each day. 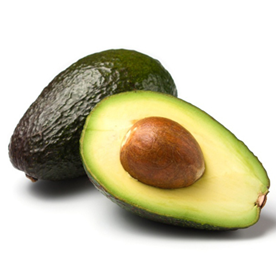 They can help the body to better absorb fat-soluble vitamins when eaten with the avocado. Since Hass avocados are rich in healthy fats, these can replace other saturated fats in your diet such as mayo or butter. I love using avocado on a sandwich in place of mayo (which I do not like anyway). Try it on a BLT- you will love it! They are also cholesterol free. A one-ounce serving of avocado )1/5 of an avocado) contains 8% of your daily fiber, 4% potassium, 2% iron, 81 mcg lutein and zeaxanthin and has less than 1 g sugar. It has 50 calories. Click here for my simple guacamole recipe! -Swap mashed avocado on a sandwich for mayo. Avocado is a healthier fat option than mayonnaise and makes an excellent sandwich topper. -Have sliced avocado on a veggie sandwich or a salad. -I like making salad dressing using avocado- I mash up avocado, a lot of lime juice and a little oil and garlic. -Use fresh avocados as opposed to processed dips (not all avocado dips are processed- check the labels). -I make my guacamole with chopped onion, tomatoes, lime juice, onion powder and garlic powder. -I make a soup called Chipotle Chicken Avocado soup which is a spicy Chipotle broth with shredded chicken and chunks of avocado. My family is obsessed with this soup. Check out this video on avocados to learn more. Love One Today has information for avocado parties, recipes, nutrition information and more. The Hass Avocado Facebook page as well as the Twitter page @HassAvocados has additional information as well. The giveaway will be for a $50 Visa gift card from Hass Avocados. I learned how cute and smart kids can be! That avocado is a fruit. I didn't know that until I watched this video. What? I have no idea that avocado was a fruit! You really do learn something new every day! Vegans don't eat anything that comes from animals. That would be a difficult diet for me. I would have also followed you on gfc and bloglovin' but I can't find those anywhere on your page? I learned that avocados were fruit. If you don't go to sleep, YOU'LL DIE.